The most frequent question I get about being a travel blogger after the standard “what's your favorite country?” and “how do you make money?” usually relates to how I decide where to travel next. My answer is always “it depends.” Sometimes I go somewhere because of a specific event or because the timing just works out. Sometimes I get invited to travel to certain places by tourism boards. And sometimes I find that a destination is just suddenly calling to me and I can't ignore it. This is exactly what happened with Morocco. 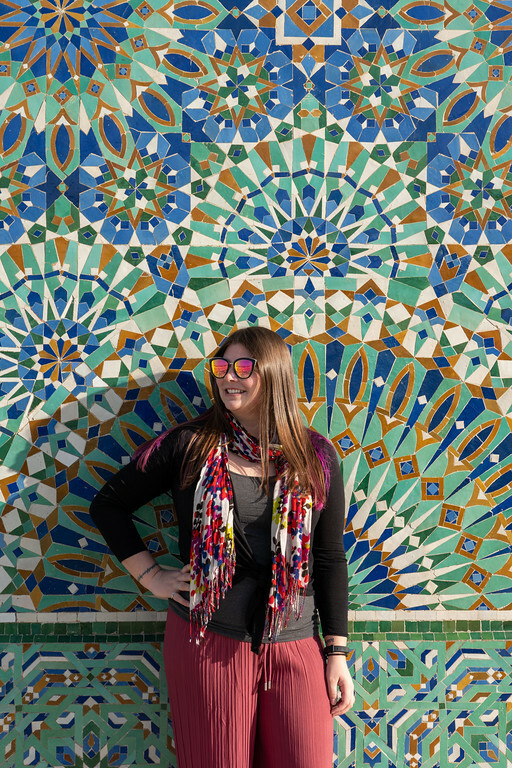 For years, Morocco had never been super high on my travel wishlist. It was one of those places that I assumed I'd make it to “one day,” but not one I felt any particular urgency to visit. But then in 2018 something changed. I can't say what it was – maybe a combination of gorgeous Instagram shots and the fact that I enjoyed my 2017 trip to Egypt so much – but I suddenly found myself with a fierce desire to visit Morocco. When I feel these fierce pulls to a certain destination, I can often be quite impulsive with my travel plans. Just a couple weeks after having the realization that I really wanted to visit Morocco, I was booking a tour with Intrepid Travel during the company's Cyber Monday sale. I expected to like Morocco, but I ended up absolutely LOVING my time in the country. Part of this came down to the stars aligning for this trip (I went at a great time of year and found myself in a very small group with a great guide), and part of it came down to my expectations for Morocco really being blown out of the water. 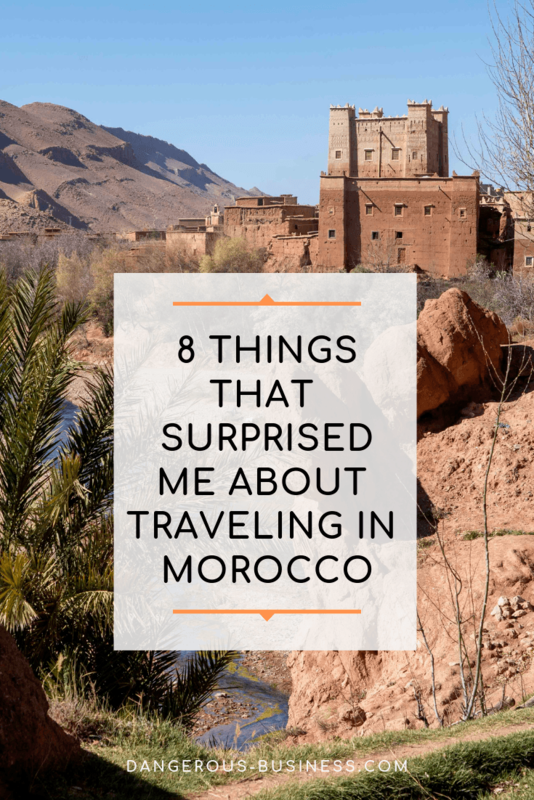 I'd had some preconceived notions about what traveling in Morocco would be like, and, as it turned out, many of them were just wrong! Is Morocco safe to travel to? Well, my answer would be that it's no more dangerous than any other country you might visit as a tourist. In fact, it might be safer than several countries that tourists flock to all the time if you look at violent crime rates. I did not feel in danger as a female traveler. Even though Morocco is geographically located in North Africa, the country didn't suffer like many of its neighbors did after the 2011 Arab Spring. Morocco is fairly stable, politically speaking, and there haven't been any violent uprisings there in recent years. The things I worried about the most before traveling to Morocco were petty crime like pickpocketing, and experiencing verbal sexual harassment as a woman. I'm happy to report that I never felt in danger in Morocco (even when walking around on my own), and that I didn't even experience the level of harassment that my pre-trip research had prepared me for. 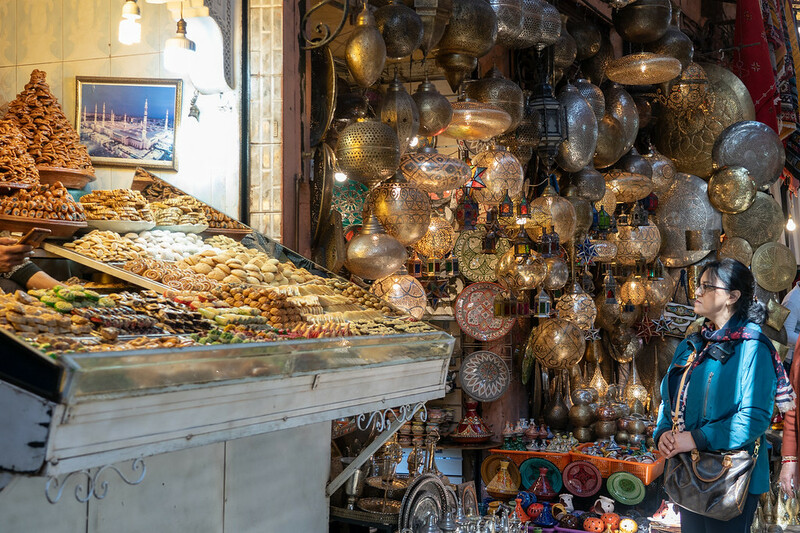 Will you get comments walking through the souks as a solo female traveler? Yes. But I get similar comments walking down the street in Cleveland, Ohio, so I'm not sure that should be a reason for anyone to avoid the country. Morocco passed a new law last year that imposed tougher penalties on sexual harassment and violence against women, and tourist police are often undercover in the most touristy areas to help keep people safe. At least two women I spoke to who had previously visited Marrakech (3-4 years ago) commented that the city felt safer and the vendors less “pushy” in 2019. This is not to say that Morocco is 100% safe, or that nothing bad could possibly happen to you there; bad things can happen ANYwhere. But statistics show that you are far more likely to die in a car crash on your way to the airport than from any violent crime while traveling. I didn't know this about Morocco before I visited, but the country has been known throughout history for its religious tolerance. There's been a notable minority of Jewish people in Morocco for centuries (many of them fled to Morocco during the Spanish Inquisition), with almost every major city having a Mellah, or Jewish Quarter. 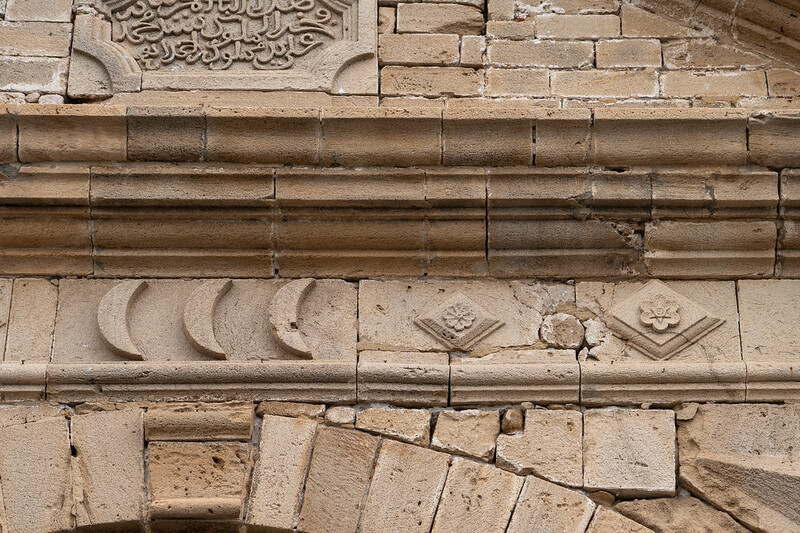 On this gate leading into the Essaouira medina, you see crescent moons (associated with Islam), and also a Star of David inside the flower on the right. The current Moroccan King, Mohammed VI, has made efforts in recent years to restore and preserve hundreds of synagogues and Jewish cemeteries around the country, further solidifying the importance of this relationship. This religious tolerance undoubtedly adds to Morocco being quite peaceful and stable. Before visiting Morocco, my only other experience in North Africa had been in Egypt. Egypt was a fascinating country, but it felt quite same-y wherever you went – the cities felt similar, the color palate was the same dusty tan, and the desert seemed to encroach everywhere. Even though any map will show that Morocco has only a very small sliver of the Sahara Desert within its borders, I erroneously assumed that Morocco would be similar to Egypt. But how wrong I was! Morocco has such a diversity of both cities and landscapes. 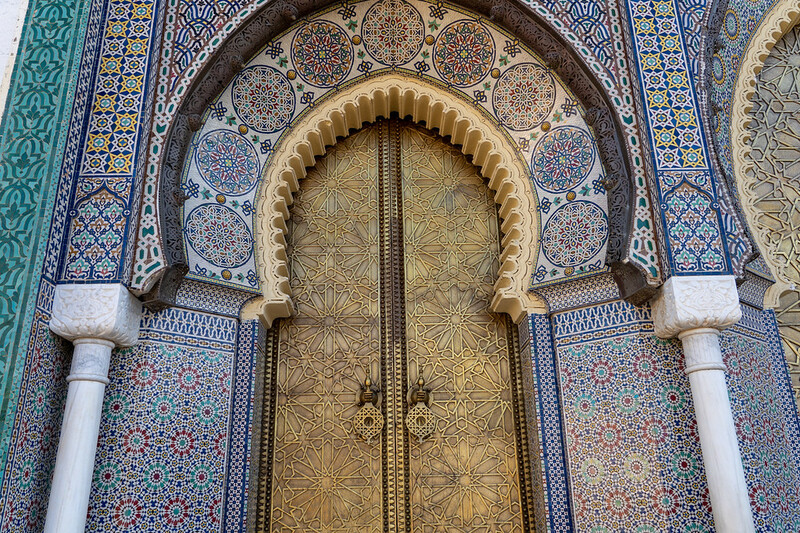 Fes with its labyrinthine medina is completely different from Marrakech's and its rose-colored buildings and palm trees, which is completely different from the blue-washed Chefchaouen, which is completely different from the Berber towns in the High Atlas Mountains. And the landscapes. Oh, the landscapes! There's everything from sand dunes to arid mountains to cedar forests to rolling green farmland. They even grow grapes and make wine! The diversity of Morocco was something that definitely surprised me. Morocco has a long history, guys. At one point it was part of the Roman Empire, it's been home to nomadic peoples for millennia, and it has gone on to influence several other cultures (you can't visit Spain or Portugal without seeing tiles and Islamic arches!). 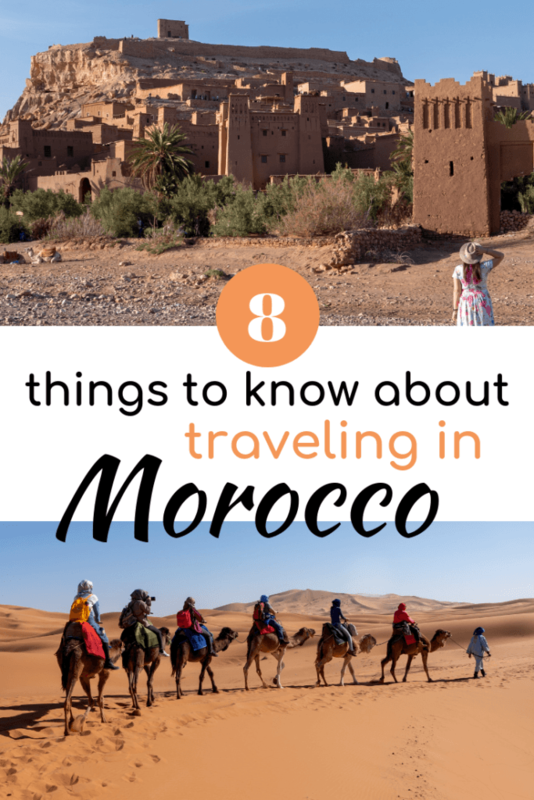 I knew that Morocco would have some interesting sites to see, but I had no clue that we'd be visiting a UNESCO World Heritage Site or ancient town or other historical marvel just about every day on this trip. 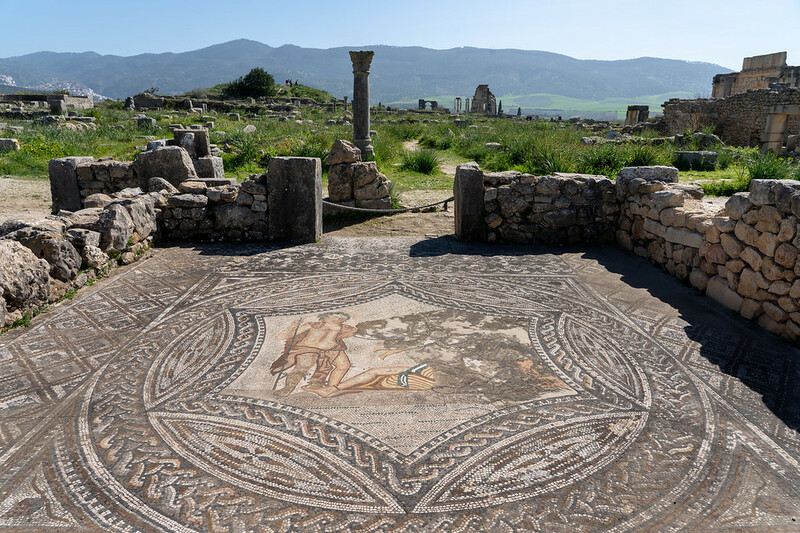 Volubilis* – A former Roman city, complete with lots of mostly-in-tact mosaics that rival the ones you can see in Pompeii (except that Volubilis is a hell of a lot less crowded than Pompeii!). 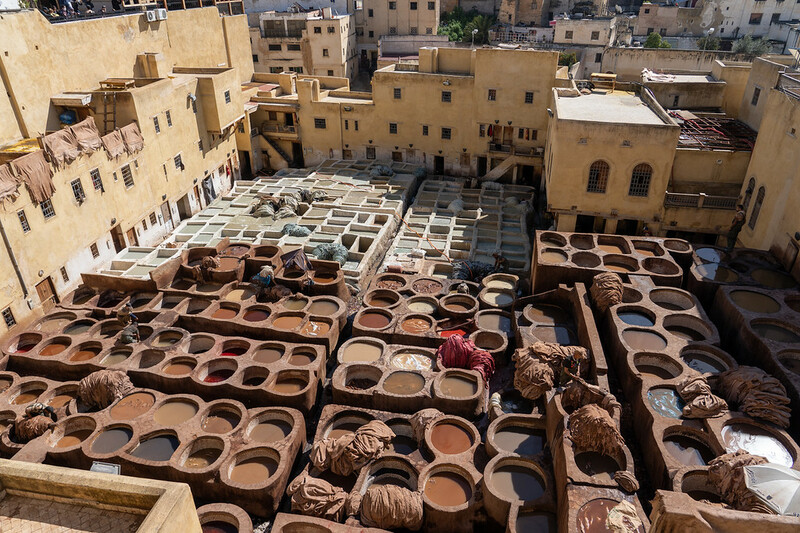 Fes el Bali* – The oldest and largest medina in Morocco, the Fes medina dates back to around the year 800 AD, and is a veritable maze of alleys and souks. Exploring some of the 10,000+ streets within the walled medina in Fes was a trip highlight. 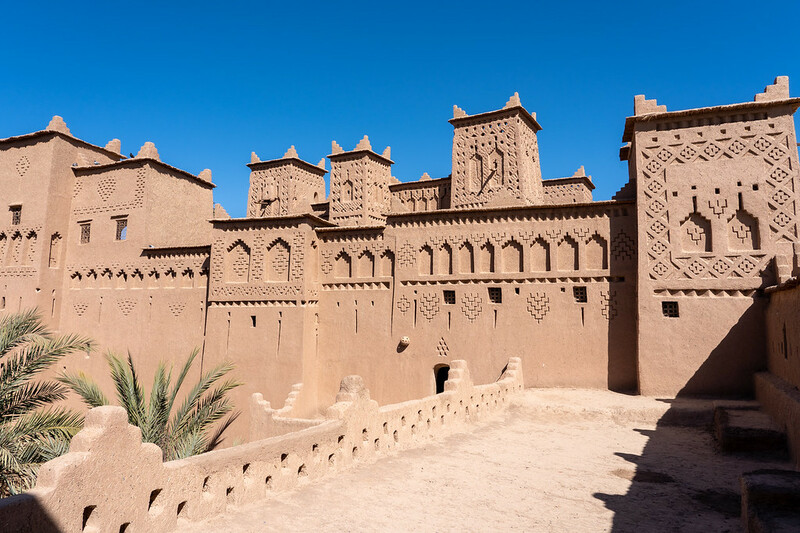 The kasbahs – A kasbah is essentially a fortress or fortified town, and they're all over Morocco, especially in the south. We visited some amazing kasbahs, including Kasbah Amridil in Skoura, which basically looks like a giant sandcastle. 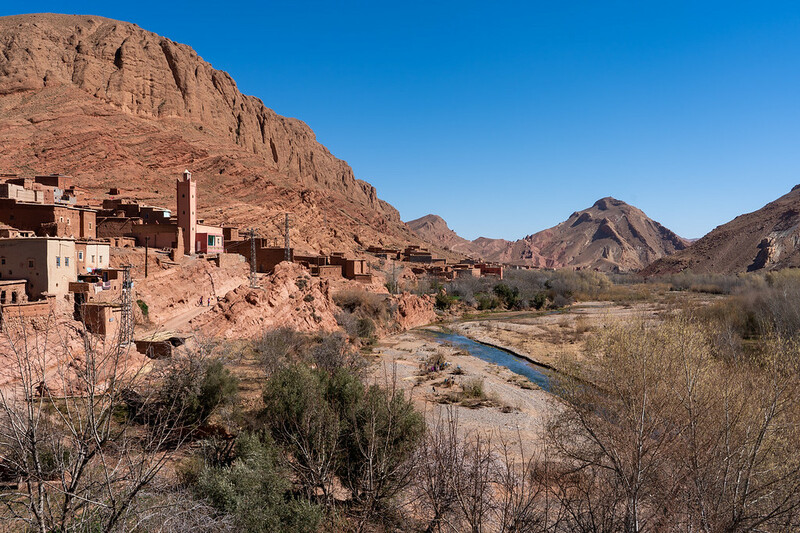 Ait-Ben-Haddou* – Officially known as a ksar (a group of earthen buildings surrounded by high walls), Ait-Ben-Haddou is essentially what you probably picture when you think of Morocco. It was built to be a waypoint along along the former caravan route between the Sahara and Marrakech, and is still incredible to behold. 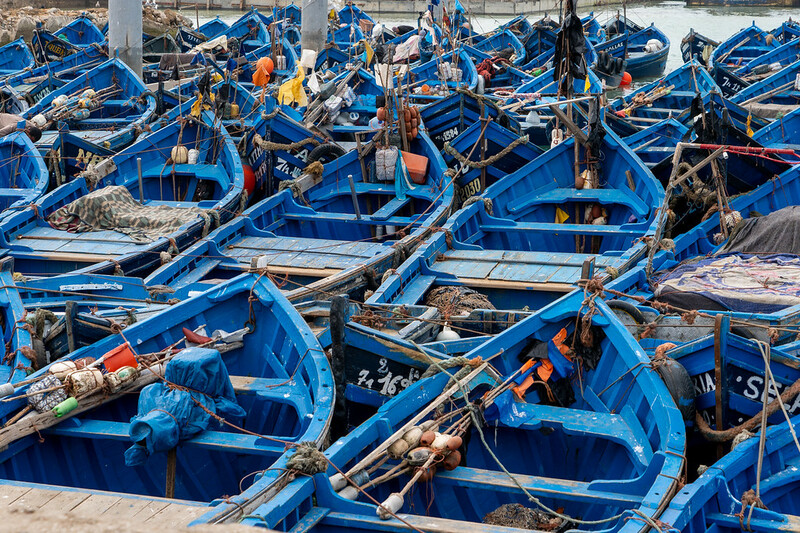 Essaouira* – I went to the seaside town of Essaouira on my own after my tour ended, simply because I'd heard so much about it and dreamed of seeing the famous harbor of blue fishing boats for myself. Essaouira is a laid-back coastal town with a cool vibe, and was definitely worth a visit. And of course there were the medinas and kasbahs in other cities like Rabat and Meknes and Marrakech, too – Morocco is basically a history-lover's dream! *These are all UNESCO sites in Morocco. I visited 7 of Morocco's 9 UNESCO sites on this trip! Usually after a couple weeks traveling in a country and eating roughly the same things over and over, I'm dying to eat something else. But you know what? I really didn't get tired of Moroccan food! 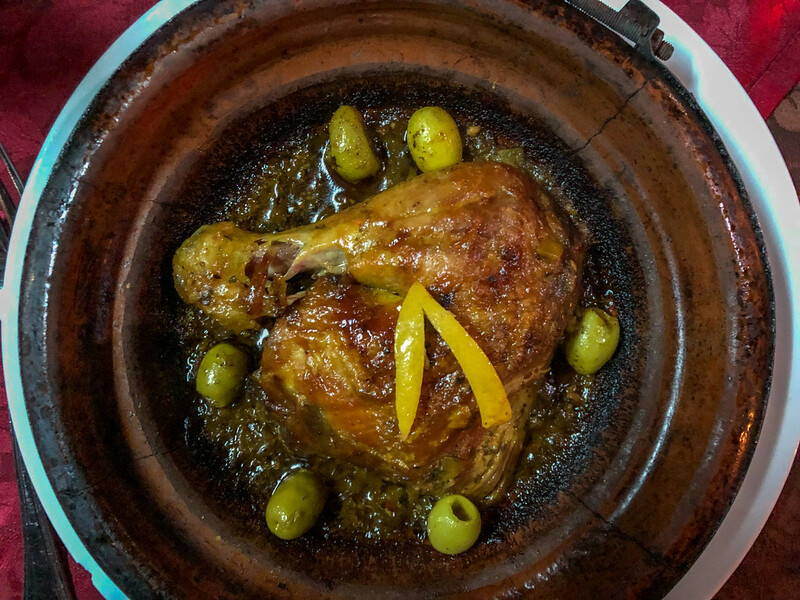 Moroccan food staples include tagine (basically meat and veggies cooked in a clay vessel called a tagine), couscous, meat skewers, olives, bread, oranges, dates, and mint tea. 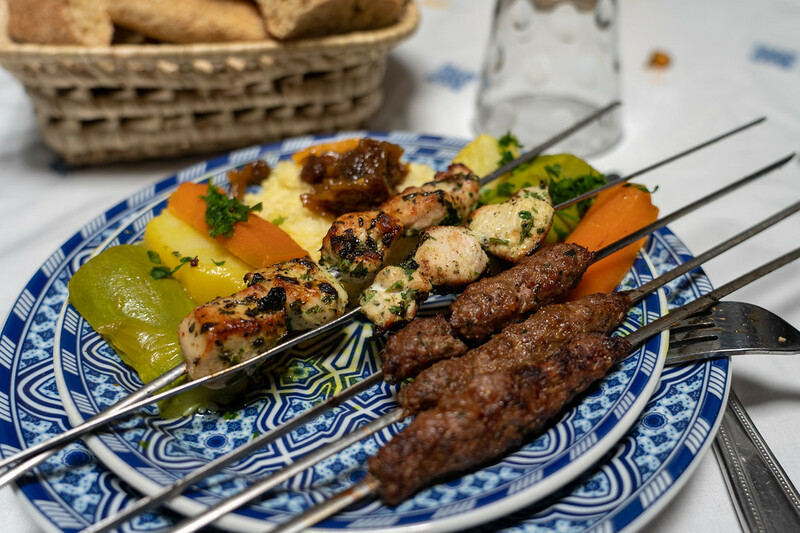 We tried some other things, too (like pastilla in Fes), but mostly ate tagines and skewers – and I didn't hate it! This chicken tagine doesn't look fancy, but it was one of the most delicious! This is mostly because each tagine dish will be slightly different depending on where you eat it and who's making it, so you don't *really* feel like you're eating the same thing over and over again. I also came to appreciate Moroccans' love of sweet mint tea any time of day, as well as the abundance of oranges. I would NEVER drink 2 glasses of orange juice per day or reach for an orange for dessert at home, but it just felt right in Morocco (and my body is still craving oranges!). I could not eat enough oranges in Morocco! I've been to other countries where “5-star” doesn't really mean 5-star, and where luxury is simply defined differently than it is in the West. In Morocco, though, luxury really is luxury. The country is far more developed and “Westernized” than most people realize; cities are vibrant and streets are clean and hotels that boast luxurious touches really do deliver. This isn't to say that you won't encounter poverty or the occasional squat toilet, especially outside of the major cities. But overall there's a lot more luxury to be found in Morocco than I realized (yup, I totally admit my ignorance here!). 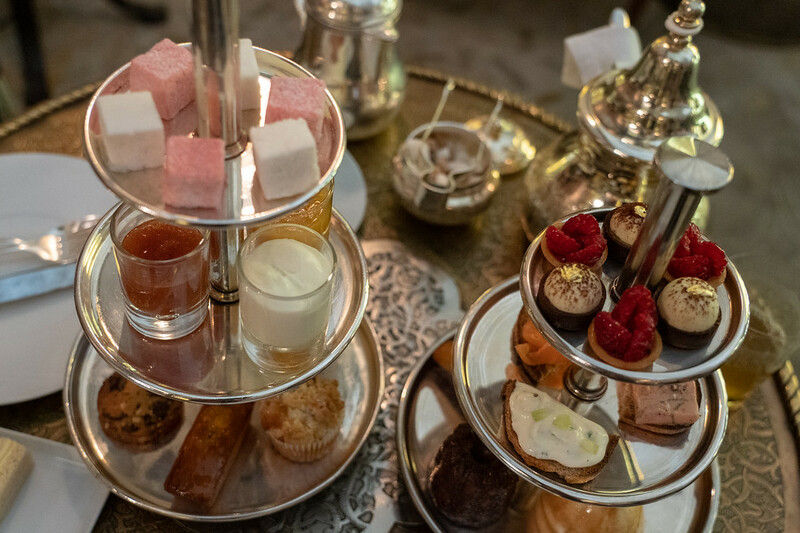 In Marrakech, I went with a few of my tourmates to the for an afternoon tea. 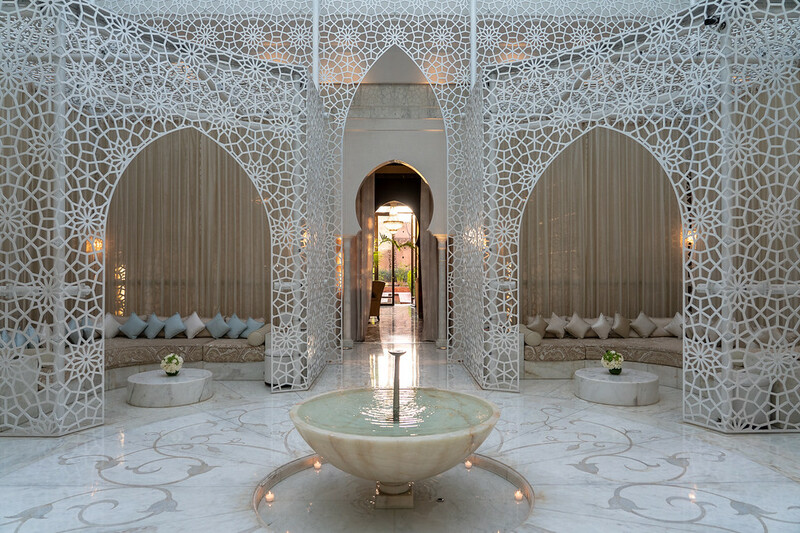 The Royal Mansour is a 5-star luxury hotel owned by the King of Morocco, and it lives up to this. 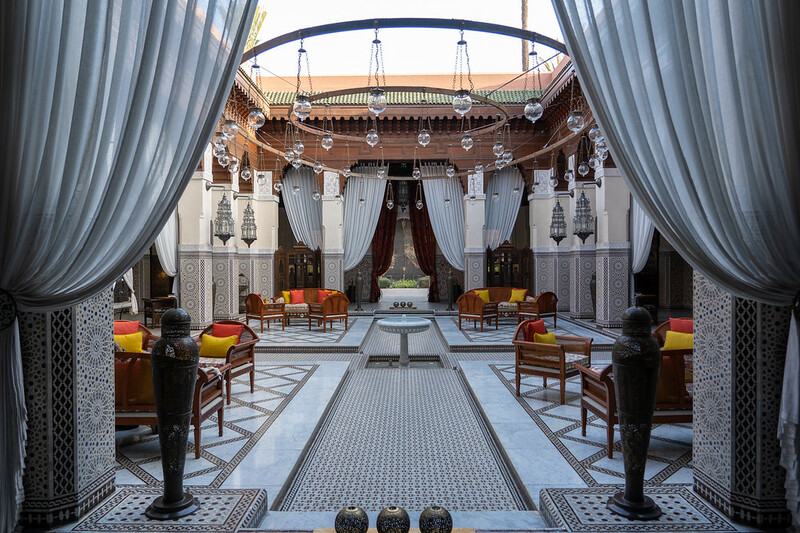 You don't just book a room at the Royal Mansour; you book an entire private riad. 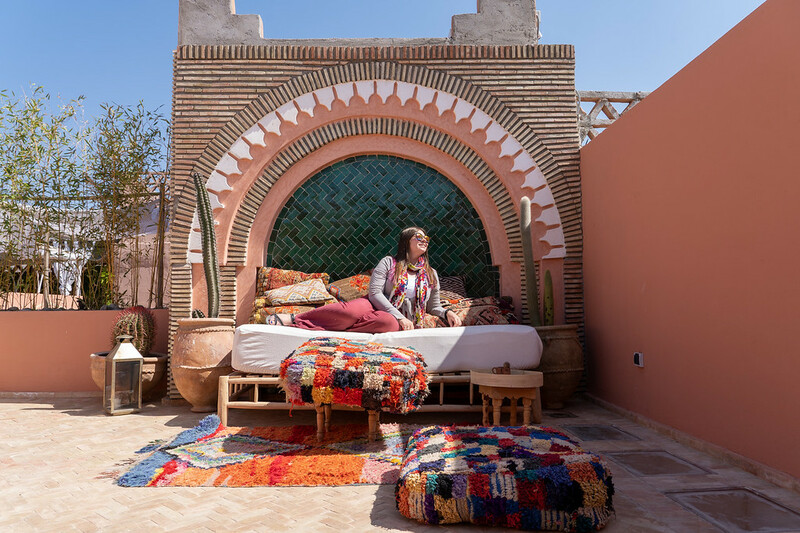 I couldn't afford to stay here on this trip, but going for an afternoon tea (and a nosy look around the hotel and spa) was the perfect – and most affordable – way to get a taste of luxury in Morocco. I've been to plenty of places where people book group tours and thought to myself “you really don't need a guide here.” There are plenty of destinations where independent travel is the better way to go. But as a solo female traveling in Morocco, I 100% believe that my experience was better because I was traveling in a small group with a local guide. 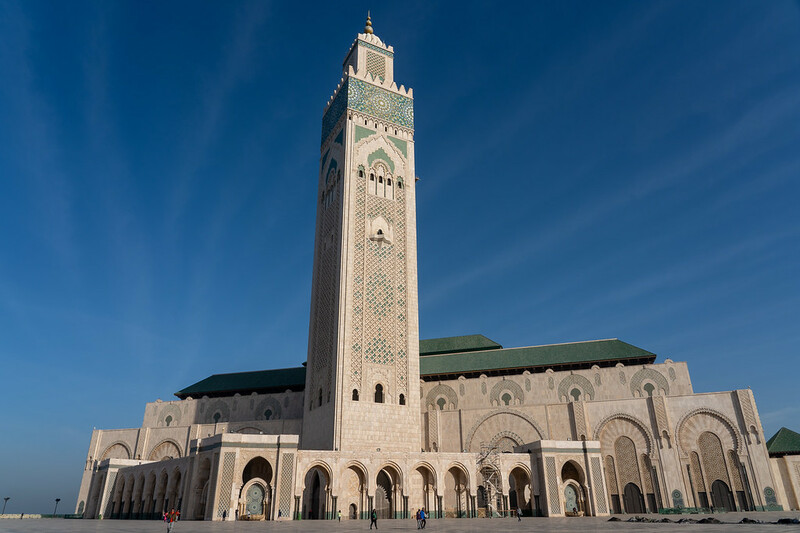 Morocco is one of the more developed countries on the African continent, and European tourists regularly take city breaks in Marrakech. But the country as a whole isn't super well-connected for tourists; it's not easy to visit certain places independently, and especially not as a solo female traveler. For example, you pretty much have to be on a tour to visit the Sahara. Not that I'm saying you can't travel solo in Morocco – you absolutely can, and I know plenty of travelers (male and female) who have done so. 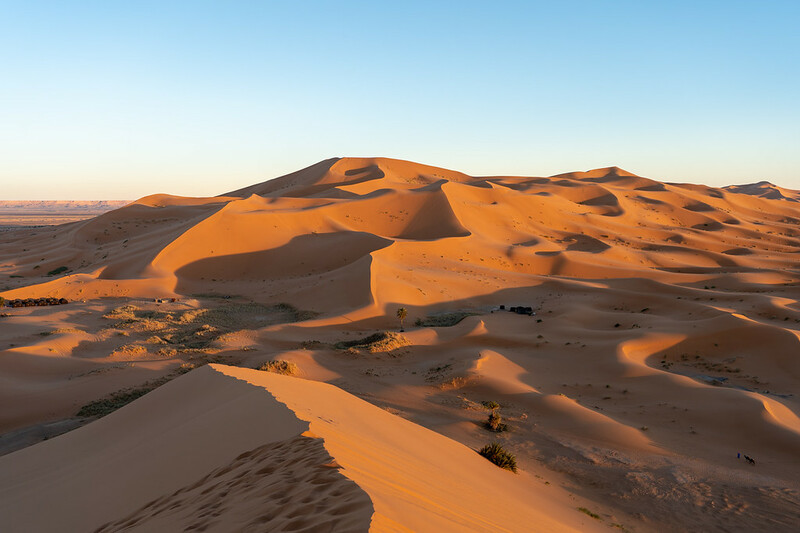 But there are places I visited that you wouldn't be likely to go on your own, and other places (like the Sahara) that you flat-out can't visit unless you book a tour or hire a guide. I mentioned before that I never felt in danger while traveling in Morocco. I think it's important to mention that I also never felt overwhelmed or lost or worried during my trip, simply because I was on a tour where all the details were handled for me by someone else. Not having to worry about things like how to get from A to B, or what accommodations would be safe for me as a solo woman, or what to order in a restaurant, or how much to tip someone made my trip infinitely more enjoyable. 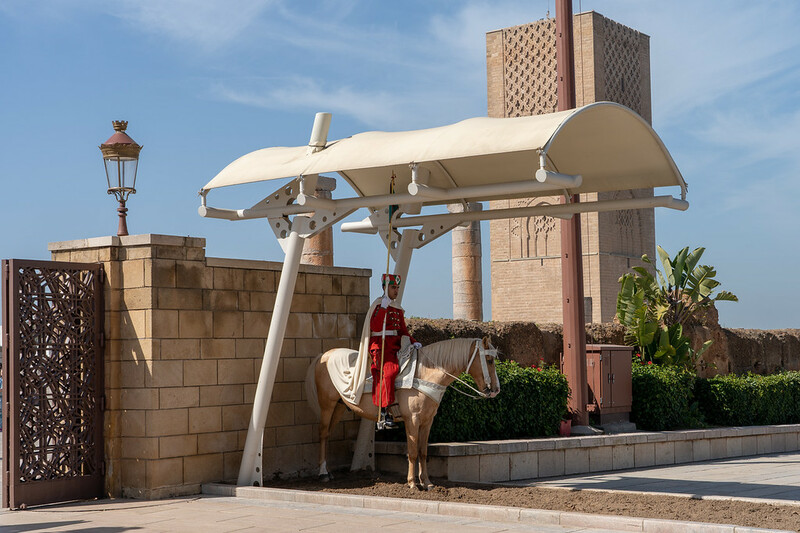 For example, our guide let us know when it was/wasn't okay to take photos of guards; it was fine here in Rabat! I won't lie to you: I know other people who have struggled with traveling in Morocco; even people who didn't enjoy their time in Morocco at all. I can only speak from my own experience, but I know that my own experience was made better by not trying to do everything on my own. 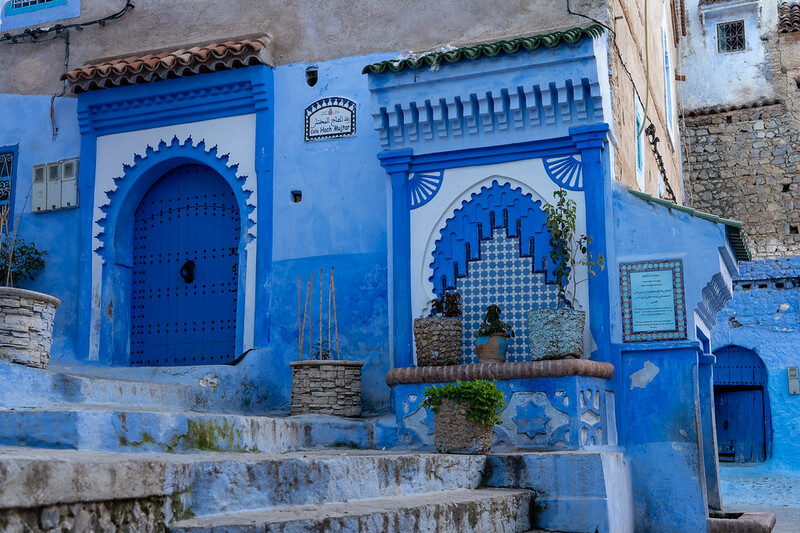 I booked the Morocco Uncovered tour with Intrepid Travel, which is a 13-day tour through the highlights of Morocco. I think this tour had a near-perfect itinerary, and can't recommend it highly enough! Looking for a tour in Morocco? 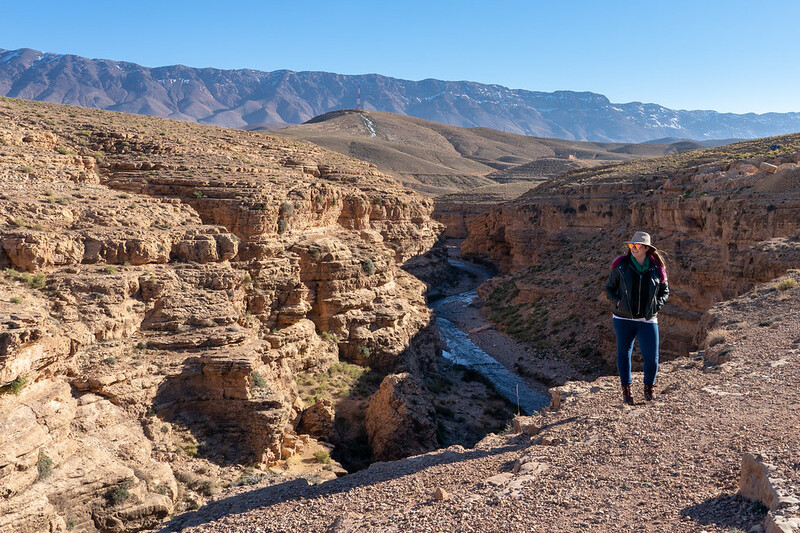 Morocco Uncovered, 13 days – this is the tour I took! Lastly, Morocco is just… different. Since my trip ended, people have been asking me “what was it like?” I know they want me to compare it to other countries they've been to; to say it was like Egypt or Turkey or Greece or somewhere else they know. But the truth is that Morocco is unlike anywhere else I've been! It has Mediterranean and Berber and North African and Islamic aspects to it, both in landscapes and culture. But I can't compare it to anywhere else I've been. Morocco is unique. It's a land of colorful tiles and golden sand dunes. Of clay-brick kasbahs and goats that climb trees. Of piles of spices and maze-like medinas. Of striped djellabas and hot, sugary mint teas. Of juicy oranges and fluffy bread and the sweetest dates you'll ever eat. 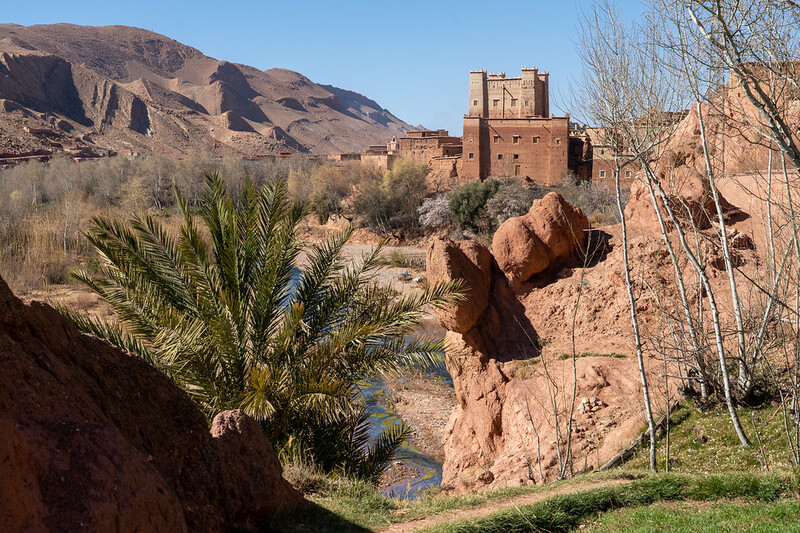 Of intricate mosques and Roman ruins and the High Atlas Mountain. Of oasis-like riads and carpets, carpets, carpets. I hope that, maybe after reading my posts in the coming weeks, you'll feel the same fierce pull to Morocco that I did. And I hope you'll visit and experience it for yourself. Have you ever been to Morocco? Did any of my observations here surprise you? Great report! I’m curious what you thought of your lodging on the Intrepid Tour? I think some of the places to stay look really lovely and I enjoy the freedom of booking my own spots. So, that’s the one thing I’m conflicted about when going on the tour instead of independently! For this trip, I would have had no clue where to book on my own (not to mention I probably wouldn’t have even visited half the places I did if I hadn’t been on a tour!). Intrepid does a good job of booking mid-range places that are often locally-owned. We stayed in some really neat places in Morocco, usually with lots of character! It’s one of the trade-offs of going on a tour, of course, but for me it was worth it! Wow, you certainly had an incredible trip! Little wonder Morocco has been featured in movies and TV shows. Look forward to reading more about your time in Morocco and photos. I knew Morocco was ruled by a monarch, however, you don’t hear about its royals as often. The King in Morocco isn’t a royal the way royals are in Europe – he has more power than the Prime Minister. I believe the official designation is “parliamentary constitutional monarchy,” but I’m not sure that truly encompasses how much power the King has! He basically runs the show in Morocco. But he’s quite popular! Morocco looks and sounds like an incredible place! I didn’t know much about it before. I really want to go there now! I’m just curious- how come you cannot go to the Sahara Desert without being on a tour? Not that I would try to go on my own, but how could they stop you from entering the desert if you weren’t with a guide? I mean, of course no one can stop you from walking into the desert on your own (and you can do this if you’re staying at a hotel in, for example, Merzouga). But the Sahara is far away from everything else in Morocco, so getting there isn’t easy unless you’re self-driving. And if you want the “classic” Sahara experience (i.e. riding a camel into the desert and camping overnight), that’s something you have to pay for, i.e. book a tour to do. Your last point is so true – I haven’t been to Morocco in several years, but I’ve never come across anywhere like it. Glad to see it’s still so beautiful…some day I’ll definitely return. It’s so unique! 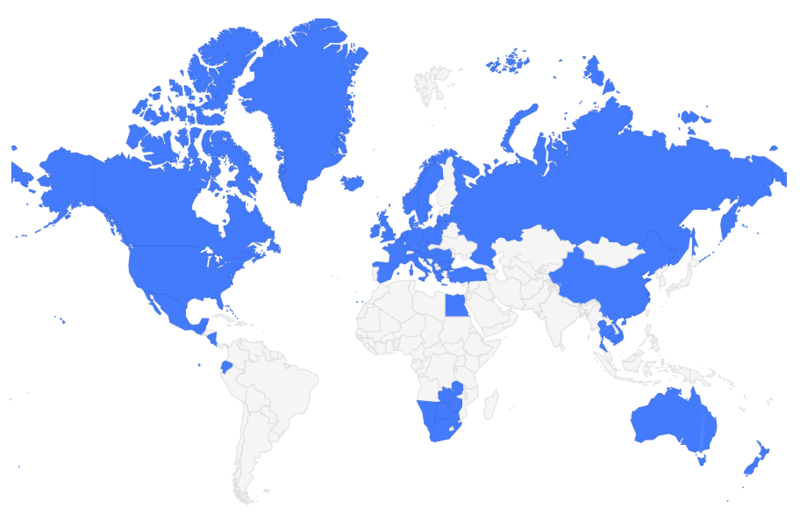 I can’t really compare it to anywhere else – which is actually pretty exciting when you’ve visited 50+ countries. There’s still so much to discover. Loved your insights! I think it’s important for people to know more about Morocco and that, while it is a place you want to keep your wits about you, it doesn’t have to be scary and/or “off limits.” It’s still just a country with people living their lives and enjoying life in their own way. And man, do I miss that mint tea! I agree that Morocco doesn’t have to be scary or “off limits” at all. I felt perfectly safe there the whole time. But going on a tour definitely helped assuage my initial fears, and certainly made traveling there easy! Morocco is TOP of my list and I’ve almost gone so many times, I think I need to commit this year. I was even in Gibraltar getting my Day Skipper license for sailing and the ferry was so cheap! But I had to get back to London. I don’t have many places on the list yet this year to hit so maybe Morocco should be priority. By the way, how do you think vegetarian food availability was there? Off question but thought I’d ask anyway. Cheers for the great tips and looking forward to seeing Morocco for myself! You should definitely go! I think you’d be fine as a vegetarian in the larger cities. And even outside of those, there was vegetarian tagine on just about every restaurant menu – you’d just need to get used to having a lot of the same thing! Great post! I’ve always wanted to travel to Morocco. Thank you for sharing. You should definitely go! Morocco is pretty amazing. It sure is! I loved all the colors and patterns. This is great!! 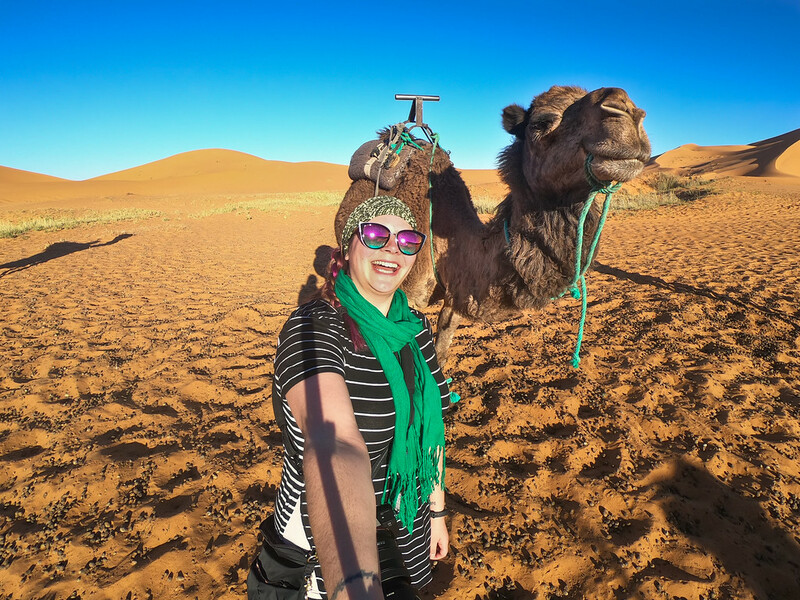 Morocco has been on my list to visit, but I was initially worried about traveling alone because I had heard some of the difficulties of getting around the country by yourself. However, after reading this post and your recommendations, I can’t wait to plan a trip there! Love your honesty and suggestions! I’m really glad I did a tour in Morocco, as it made everything a lot less overwhelming. I really loved my trip! I wouldn’t be surprised if you do! I really loved all the info about Morocco, but also-your maxi dresses are so cute! Do you mind saying where you got them, or if you have a place that’s your go-to for dresses? Fantastic post – so much great information and beautiful photos! I traveled to Morocco when I was a kid (a loooong time ago) and I would love to go back sometime soon. I found myself so (pleasantly) surprised by how beautiful all of Morocco was. It was even better than I expected! It’s definitely worth visiting! I’m glad I finally got that strong urge to go, because I loved all of it. I really love this post! I can’t wait to visit Morroco someday and I’m looking forward to your coverage on the rest of your trip. I have SO much Morocco content to share, so definitely stay tuned! Morocco hasn’t really been high on my list of places to visit until recently. Seeing people’s trip reports and pictures is definitely changing that. If I end up going solo, I’ll probably go the organized tour route as well. Even though I’m always very into doing things independently. Sounds like you can get so much more out of a tour like this in a destination like Morocco. Morocco is one of those places that’s definitely growing in popularity as word gets out about how awesome it is! I’m a big fan of independent travel, but I feel like I enjoyed Morocco as much as I did mostly thanks to being on a tour. It’s one of those places where I really do think you have a richer experience with a guide. Yes! Even the dry, arid landscapes are vibrant in their own way. I took SO many photos in Morocco. 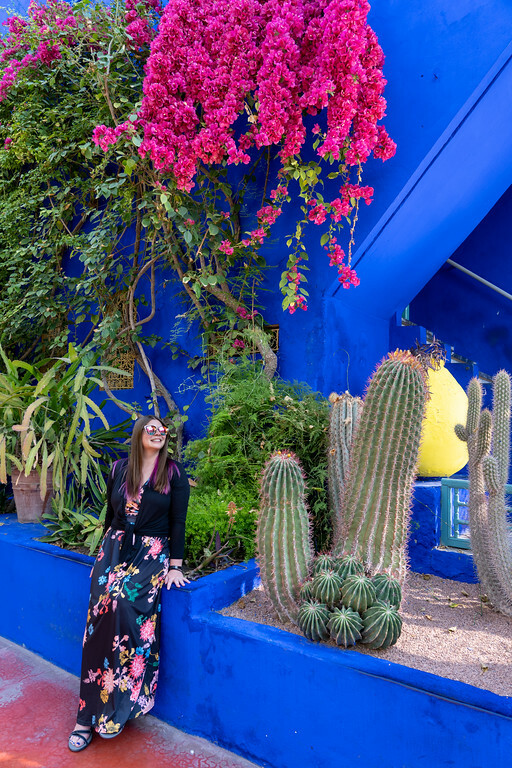 I think Morocco is one of those places that you really need to devote some time to – and you definitely need to visit more than just Marrakech to love it! Good luck with Mount Toubkal! 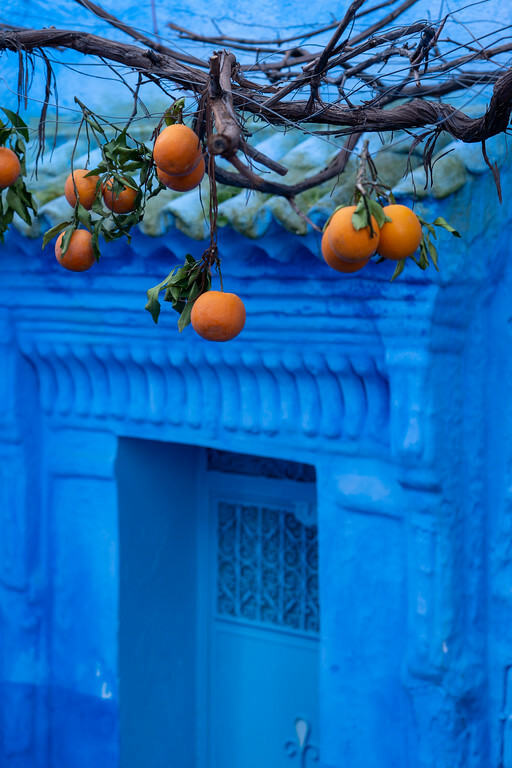 I had no idea that Morocco had so many oranges! 🙂 You’re REALLY pushing Morocco to the top of my list of places to travel this year!! I didn’t really know they were so known for their oranges, either, but they were seriously DELICIOUS.